Unit Text:	"C" Coy. 1st/5th Bn. 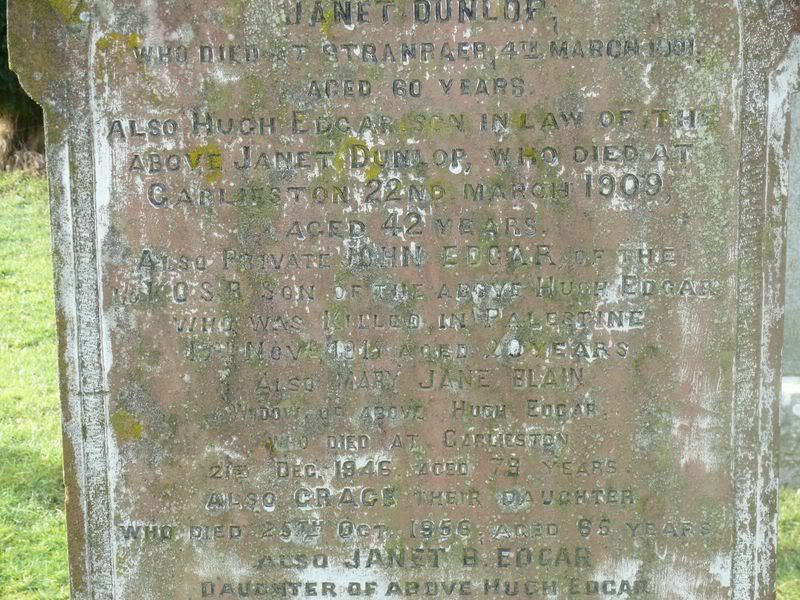 Additional information:	Son of Hugh and Mary J. Edgar, of Extreme Point, Garlieston, Wigtownshire. 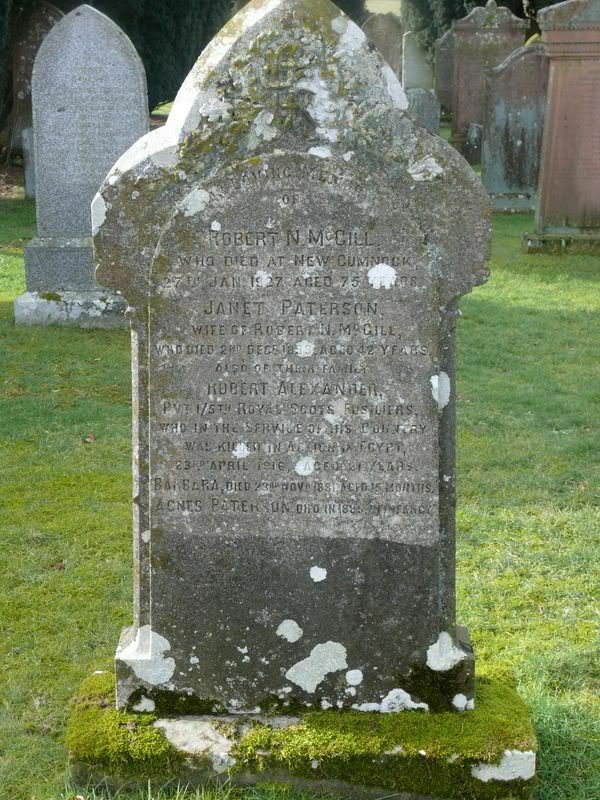 Additional information:	Husband of H. Gulline, of Abbotsford, Dunblane. Grave/Memorial Reference:	VII. E. 23. 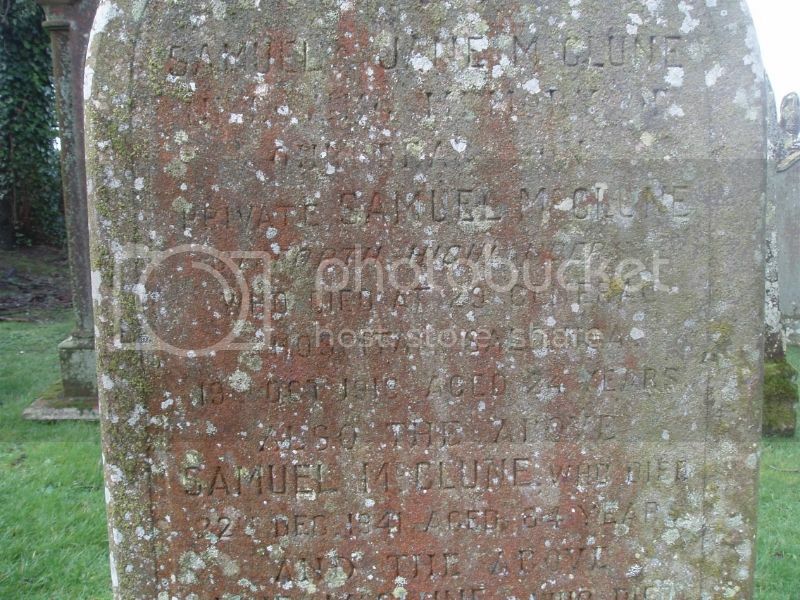 Additional information:	Son of Mr. and Mrs. Robert Gulline, of High St., Garlieston; husband of Mrs. A. 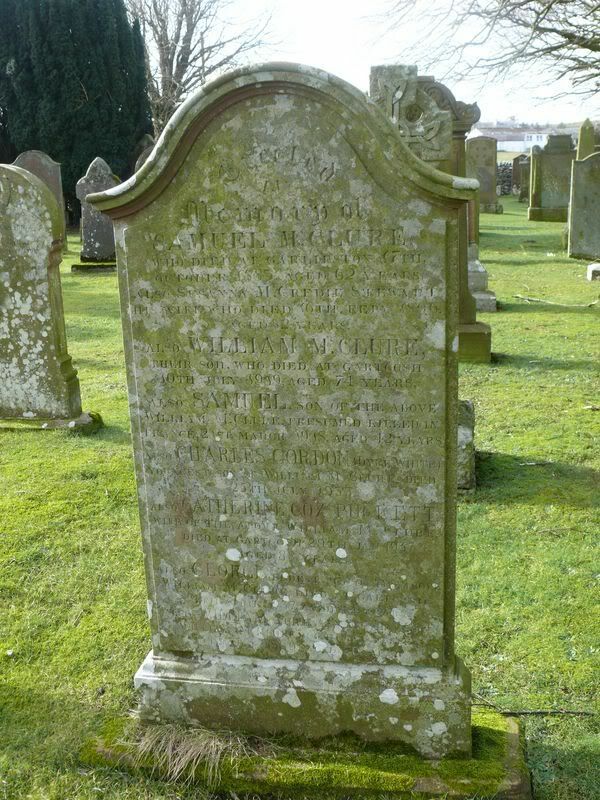 B. Gulline, of Church St., Garlieston, Wigtownshire. 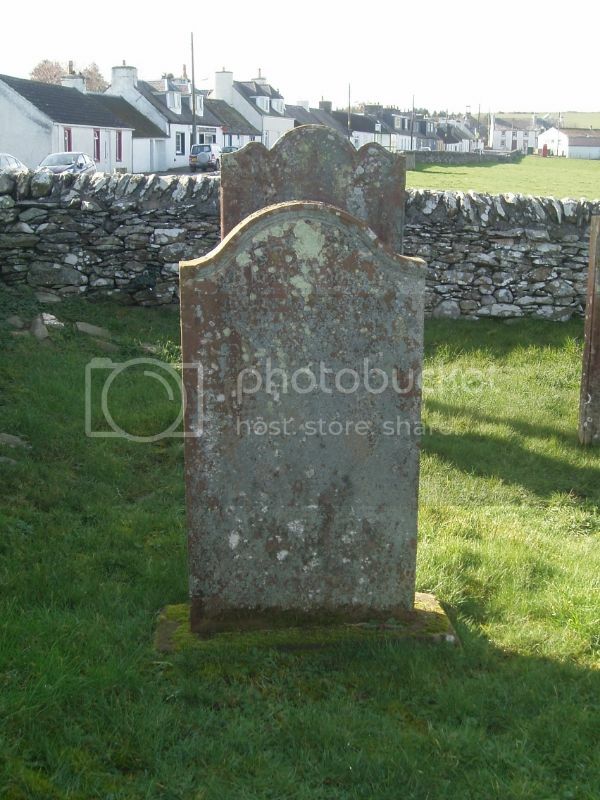 Grave/Memorial Reference:	Panel 66 to 68. 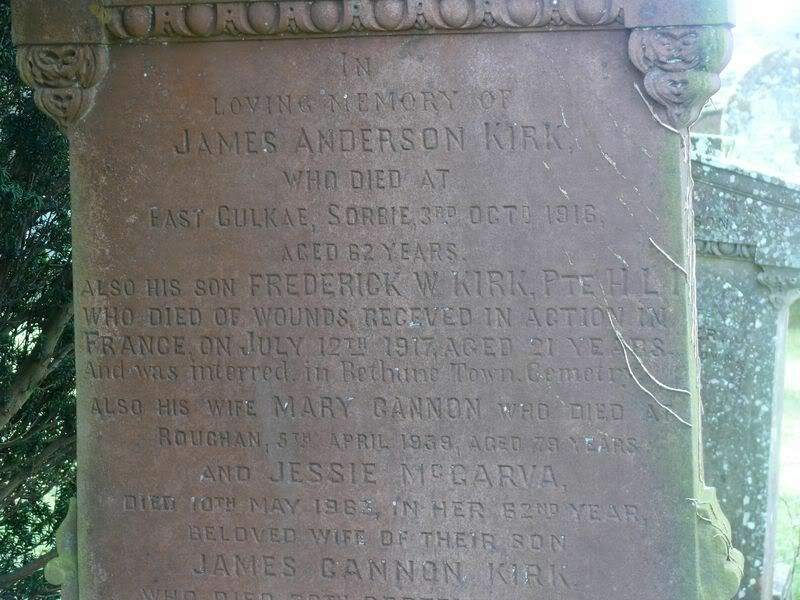 Additional information:	Son of James and Mary Kirk, of East Culkae, Sorbie, Wigtownshire. Grave/Memorial Reference:	VI. F. 42. Grave/Memorial Reference:	Bay 1 and 2. 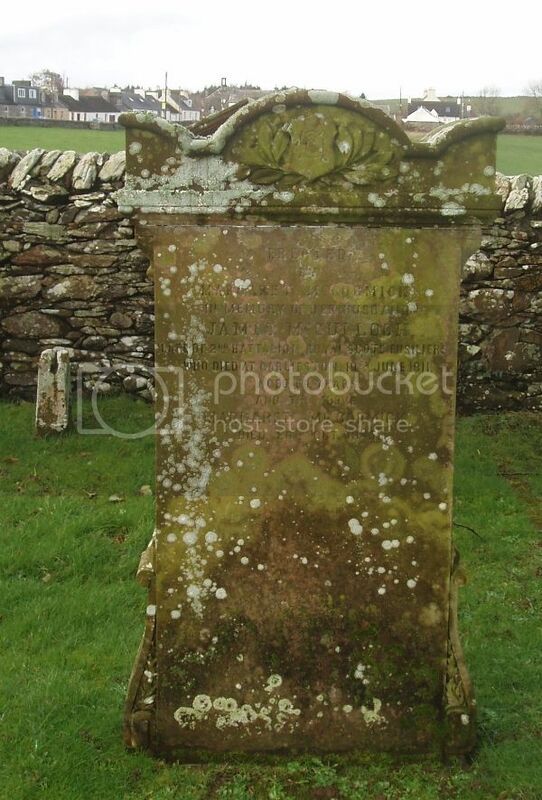 Additional information:	Son of Alec and Mary McLellan, of South St, Garlieston, Wigtownshire. 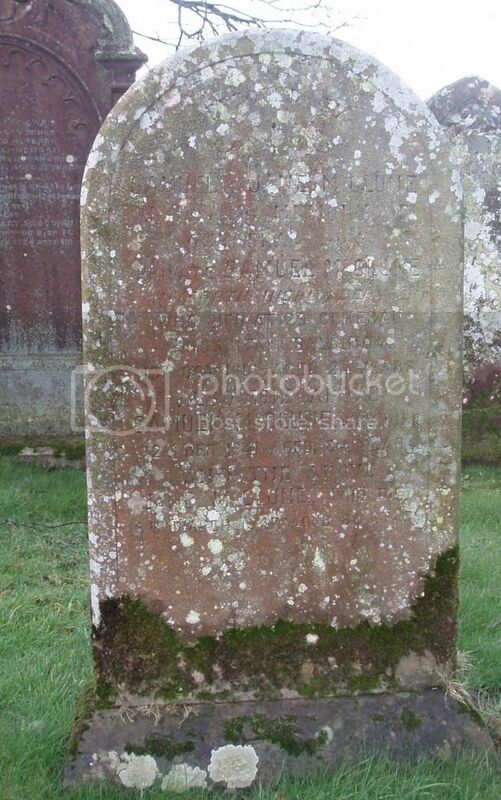 Alexander McLellan is also commemorated in Sorbie's new cemetery. 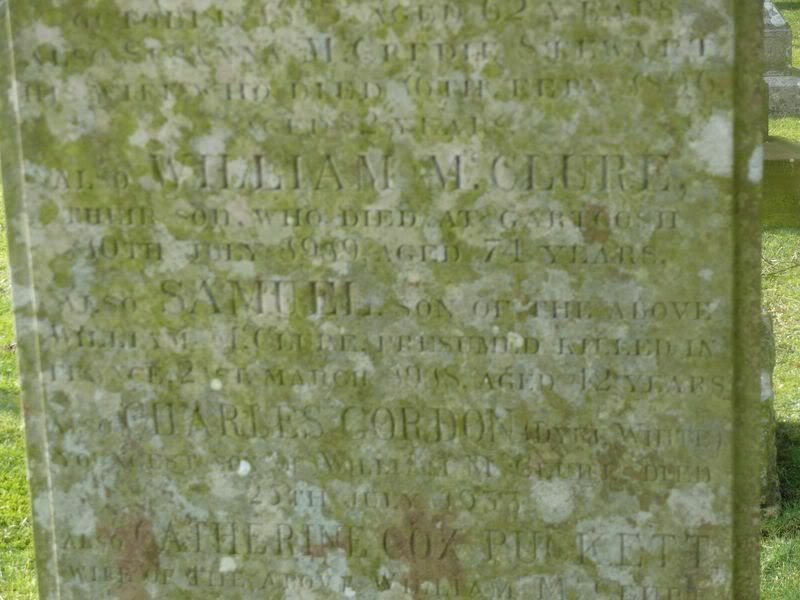 Additional information: Son of William and Jane McCreadie; husband of Maggie McCreadie, of Main St., Port William, Wigtownshire. Native of Garlieston. James McCulloch, 2nd Battalion, Royal Scots Fusiliers. 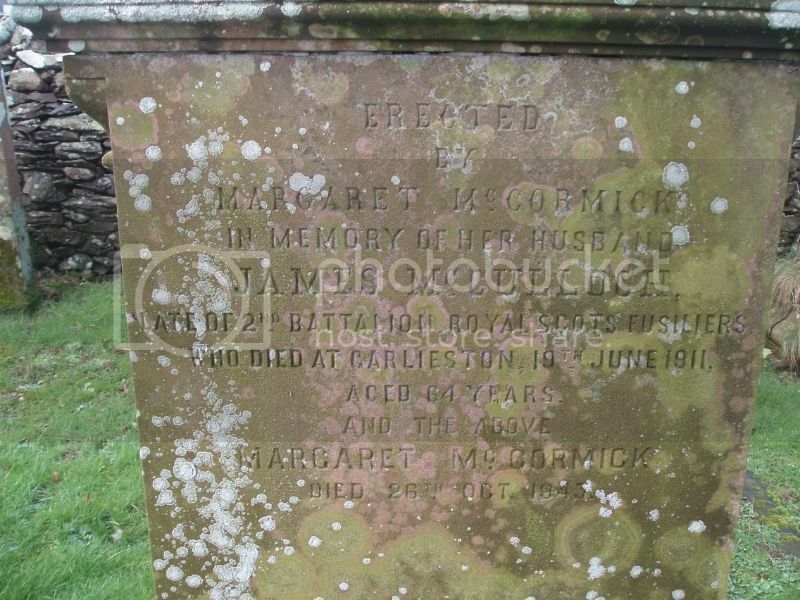 Died 19 June 1911, aged 64. Not sure whether this one qualifies as military. George Grant of the East India Company Marine Service. 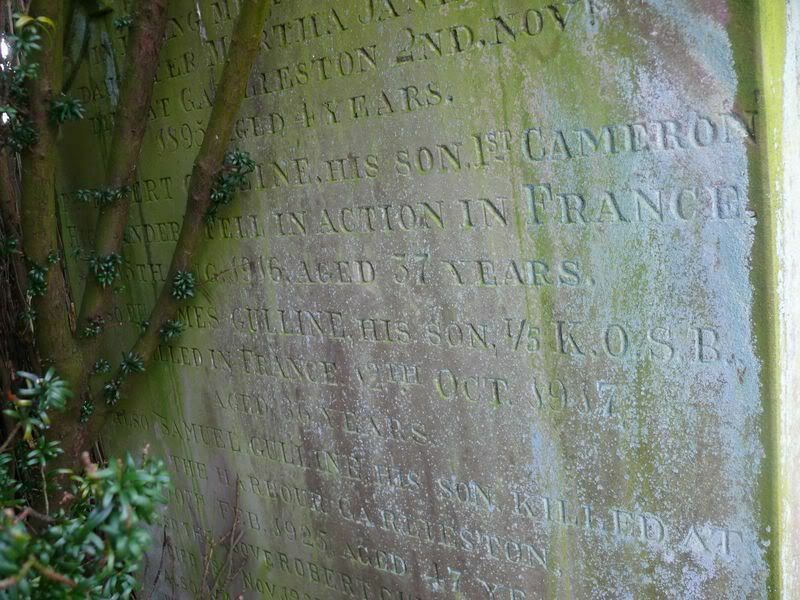 Additional information: Son of Mrs. Charlotte Smith. 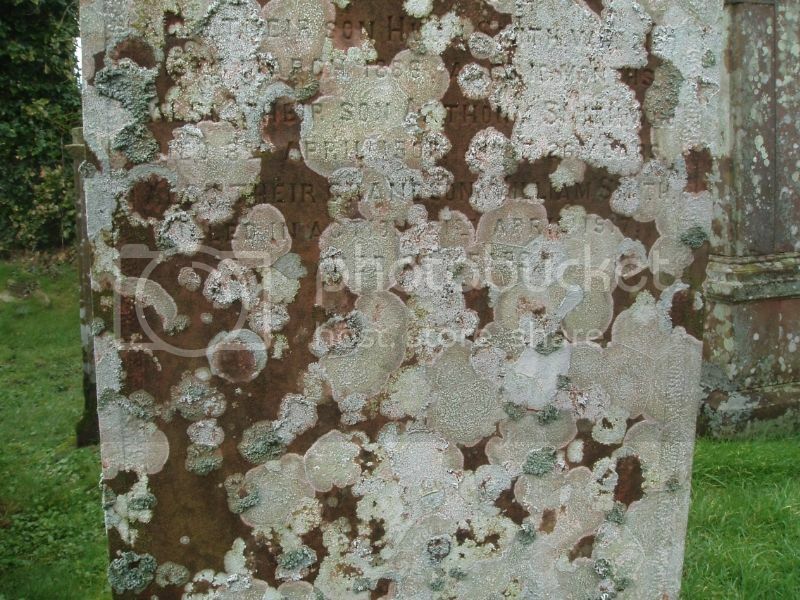 The inscription is hard to read due to a covering of lichen. 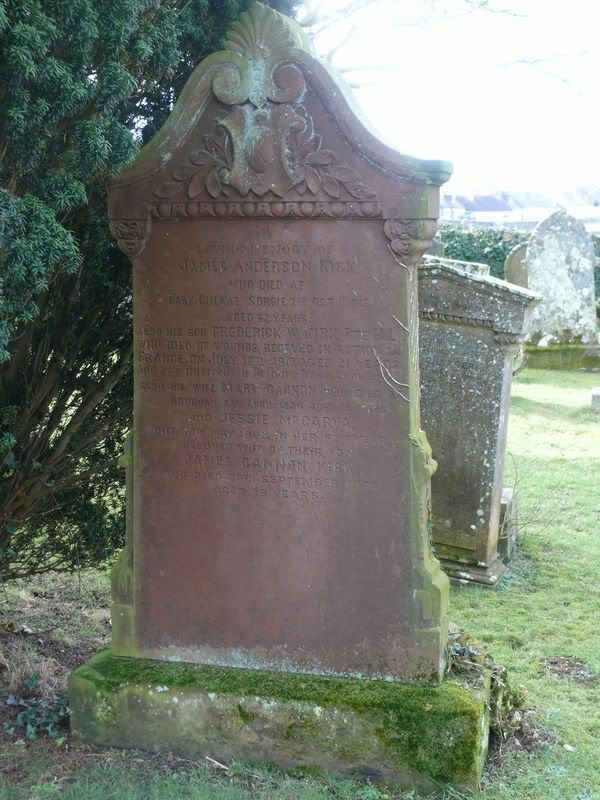 It says: Erected by Margaret Keith in memory of her husband David Smith who died 16th July 1922 aged 85 years. 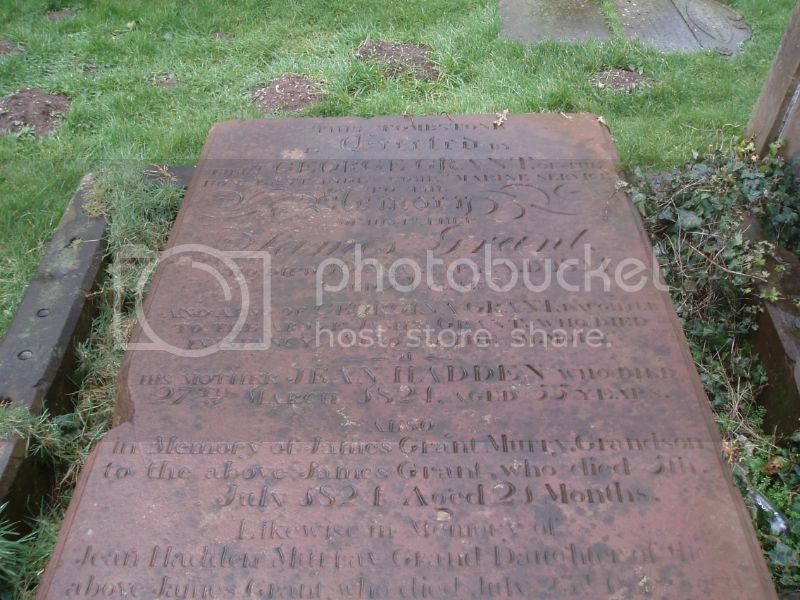 Also their son Hugh Smith who died 13 March 1886 aged 10 months. 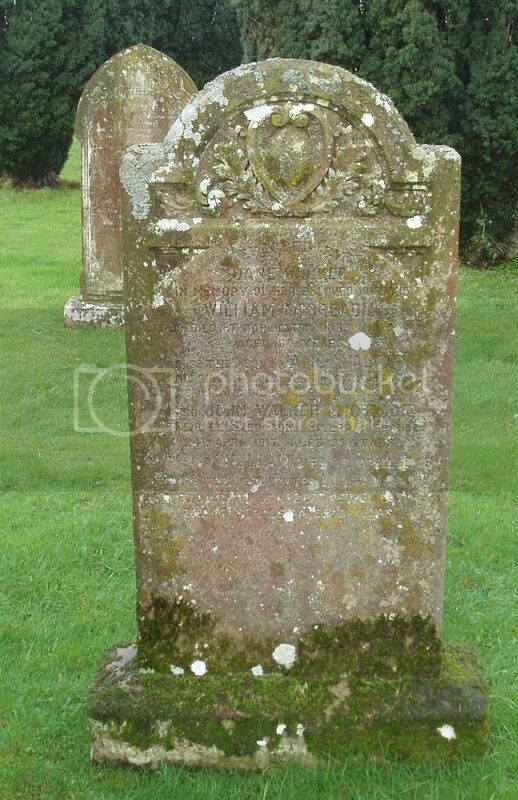 Also their son Anthony Smith who died 1901 aged 26 years. 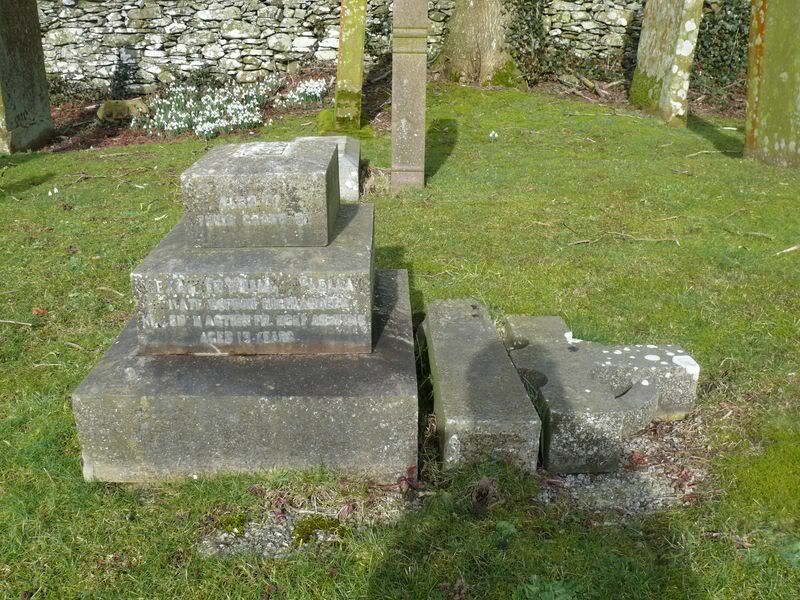 Also their grandson William Smith killed in action 21st April 1917 aged 26 years. 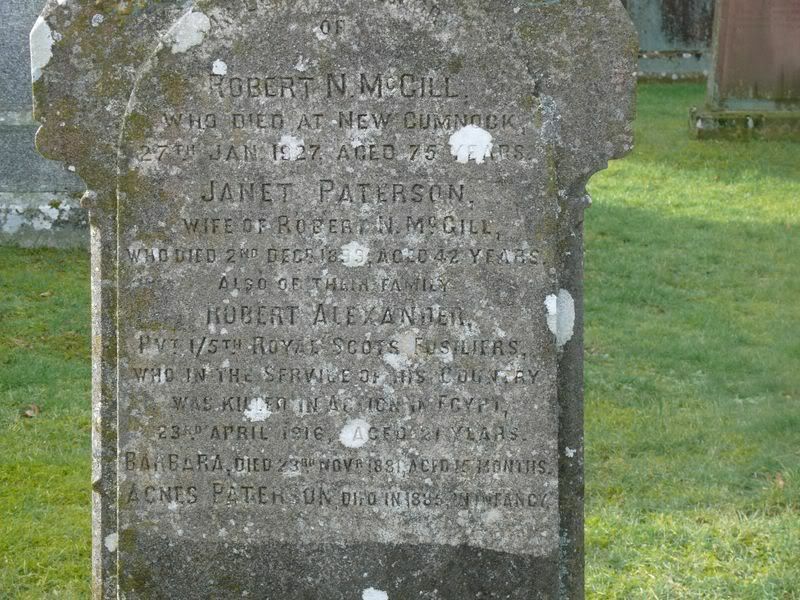 The Wigtownshire Free Press, 14 June 1917 reported: Mr & Mrs Smith, March Farm Row, Whauphill, have been officially informed that their grandson, Pte William Smith, Royal Scots, was killed in action on 22nd April. He enlisted in March last year, and went to the front in December. Prior to joining he was employed in Bladnoch Creamery, and was 26 years of age. 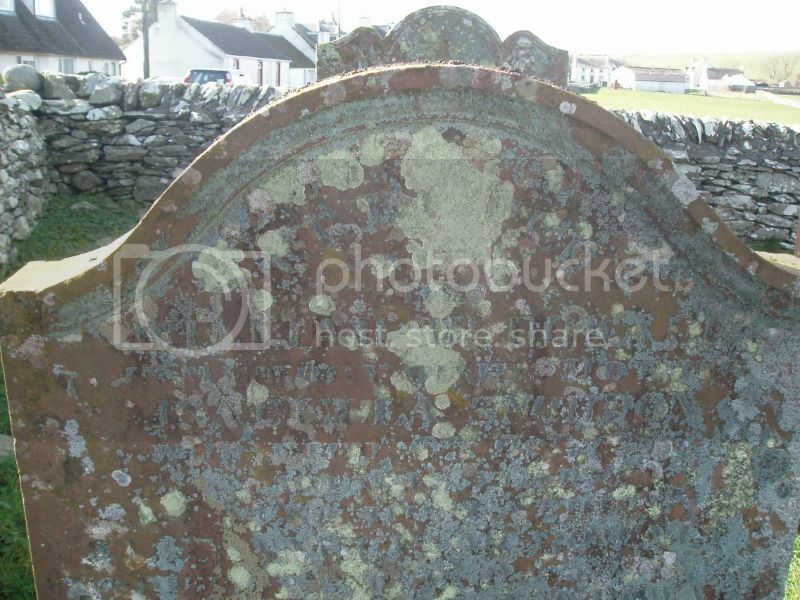 Additional information: Son of John and Margaret Trew, of Dinnans, Whithorn, Wigtownshire. 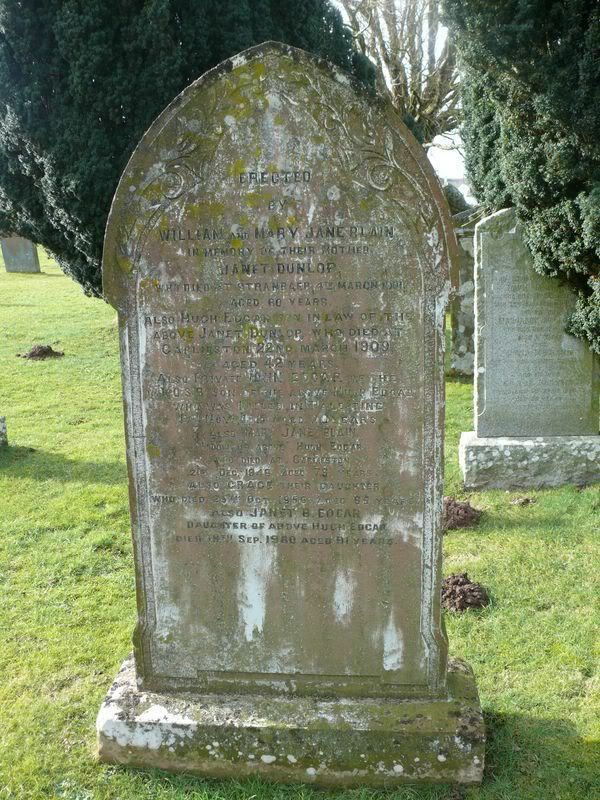 The Galloway Gazette (21 July 1917) reported: Accidentally killed on the 9th inst on board HMS Vanguard, William Trew AB RNVR, fourth son of John Trew, Dinnans, Whithorn, aged 20. 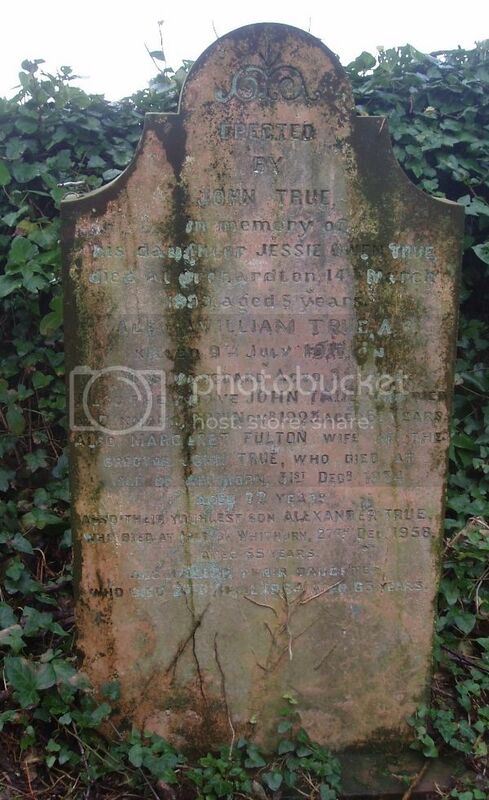 Note however that the headstone reads: Erected by John True in memory of his daughter Jessie Owen True died at Orchardton 14th March 1899 aged 5. 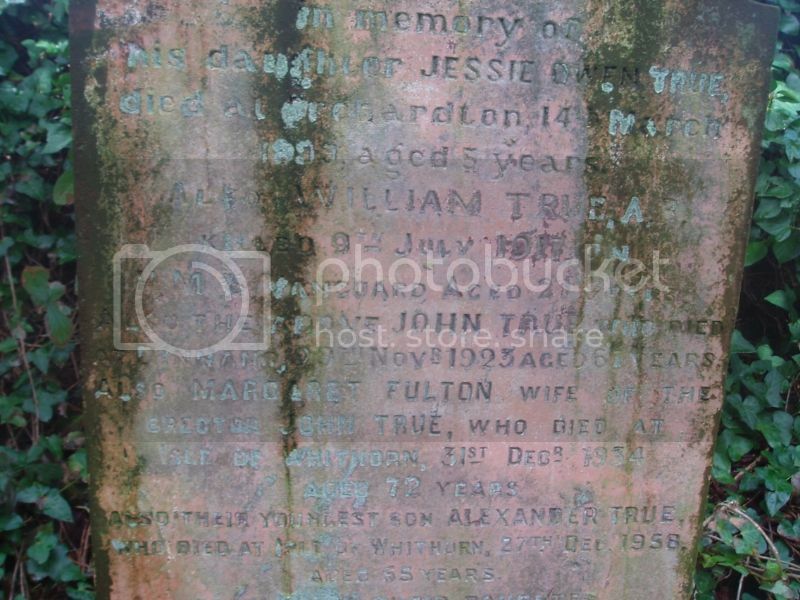 Also William True, AB, killed 9th July 1917 on HMS Vanguard aged 21 years. 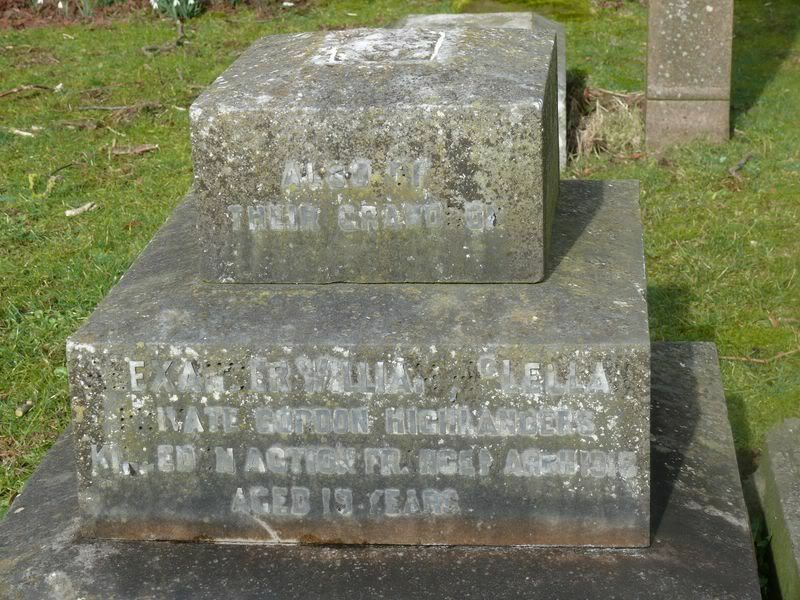 The spelling of the name is discussed at: http://scottishwargraves.phpbbweb.com/viewtopic.php?t=1476. 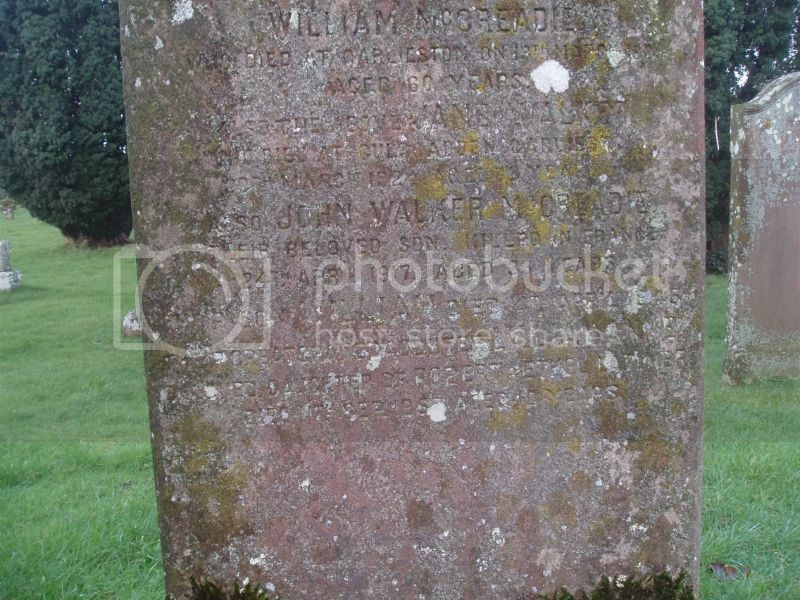 A survey of 30+ years ago was able to read the inscription as: Erected by William McDowall in memory of his mother Isabell Snoddon who died 6th Oct 1855 aged 45 years. 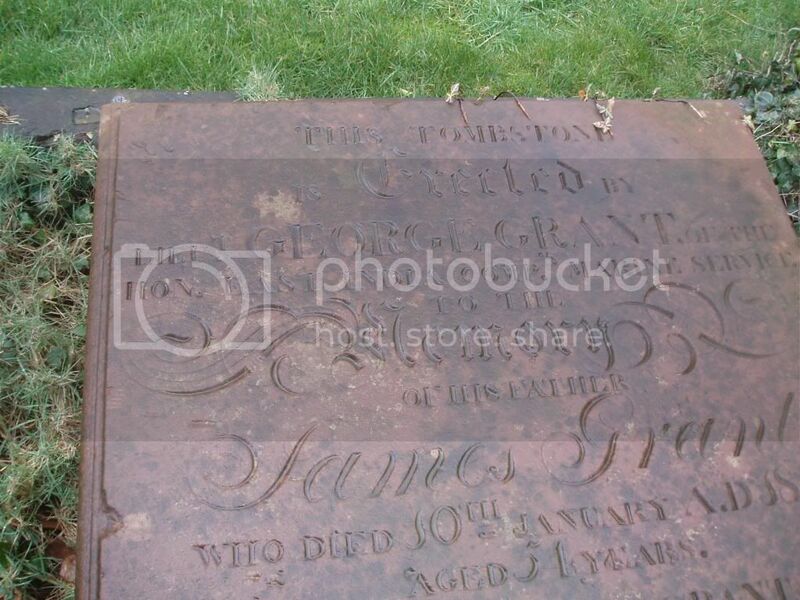 Also his father Alexander McDowall who died 29th Nov 1870 aged 77 years. 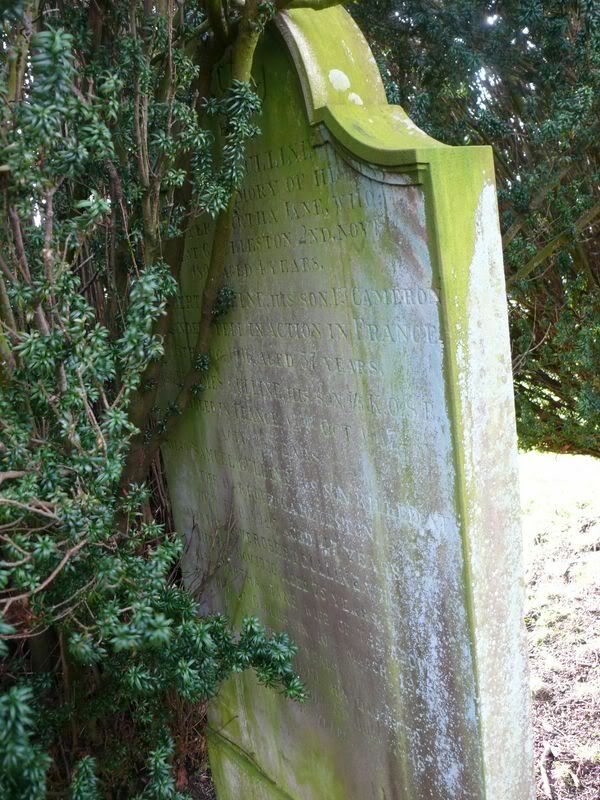 Also their son John McDowall who died at the battle of Inkerman 6th Nov 1854 aged 27 years. 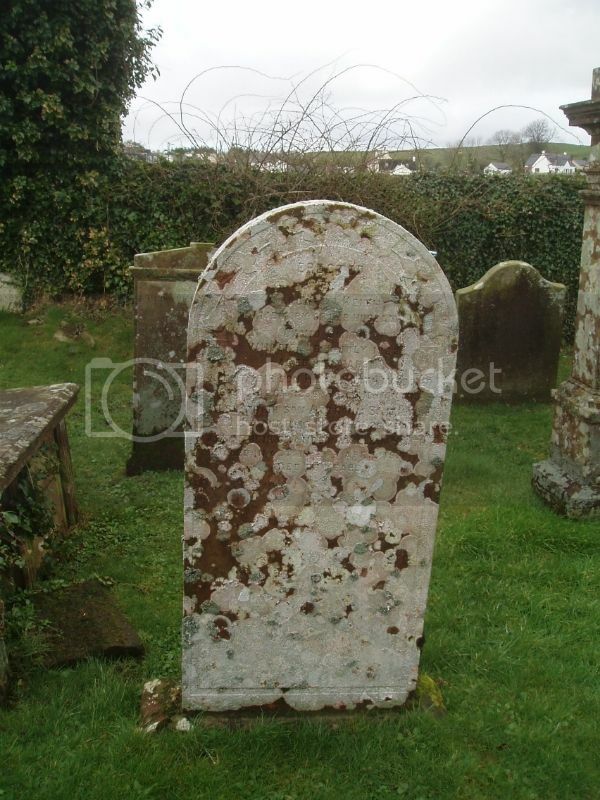 Also their daughter Mary who died 15th Feby 1898 aged 70 years.